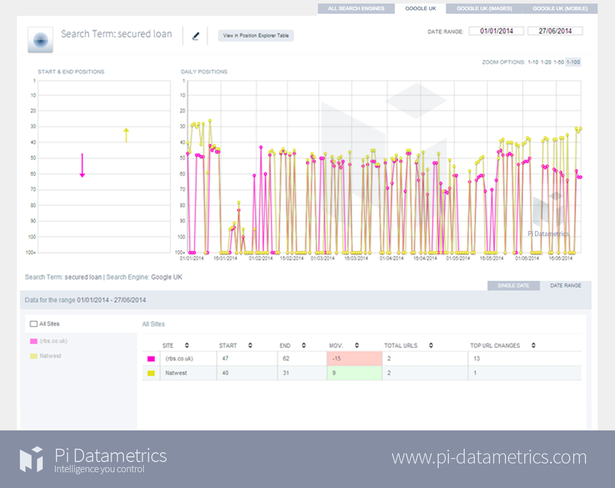 In my last post, I looked at how PC World/Currys and Tescobank/Tescocompare were harming each other’s search rankings. 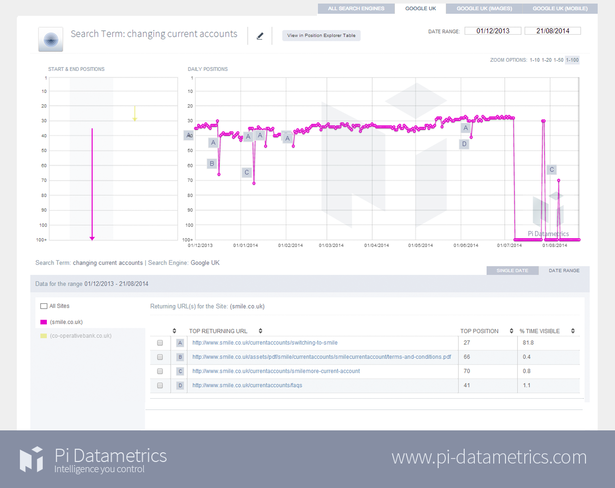 This time I have an example from RBS and Natwest, both owned by RBS Group, showing how duplicate content. We also have a similar example from Smile and Co-operative bank. In both cases, duplicate content on the sister sites is creating problems for Google. 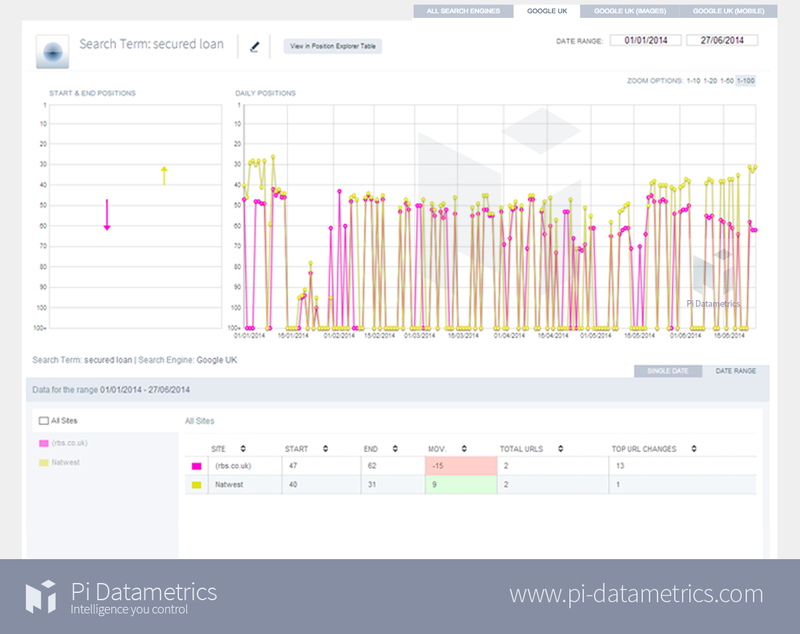 In my previous post, I looked at how PC World/Currys and Tescobank/Gocompare were harming each other’s search rankings. Google cannot decide between the two very similar sites owned by the same group. In one instance they are flipping positions, then they come together and perform a dance in the SERPs. 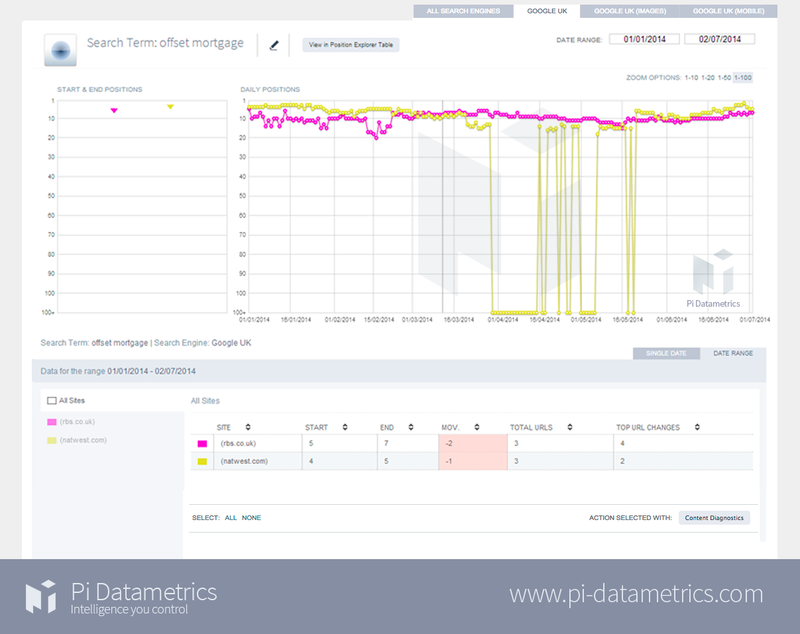 Here, for the term ‘offset mortgage’ both sites are ranking most of the time, aside from a period in April and May when Natwest’s rankings dipped below 100 on several occasions. Does the more consistent pattern since then suggest that Google has decided what to do, or can we expect further turbulence? 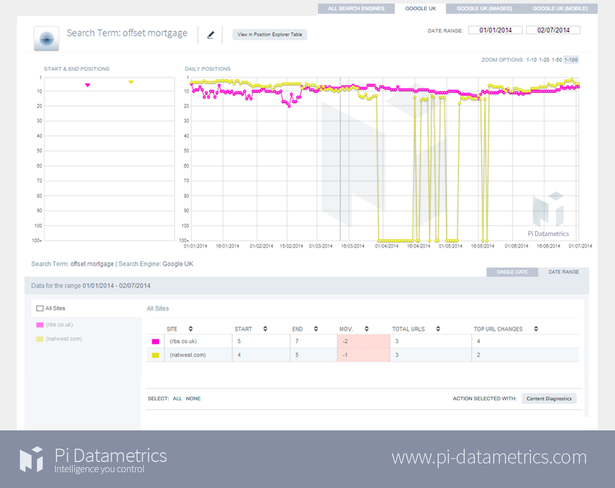 Here’s another example, for ‘secured loan’, a highly competitive keyword and one which would cost upwards of £14 per click via PPC. It seems clear that the two sites are damaging each other’s rankings here. 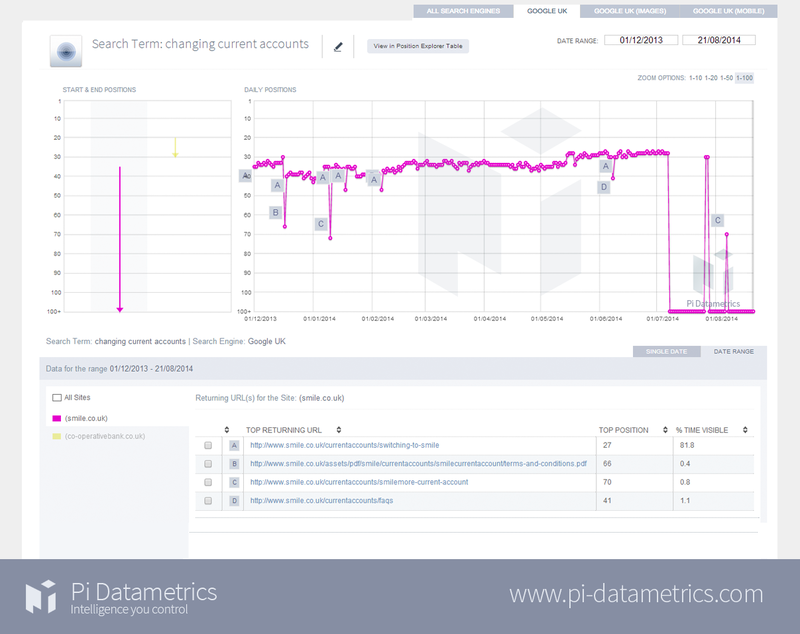 The maximum rank of roughly midway down page three on Google was achieved by Natwest in early January and hasn’t been bettered since. In fact, both sites have lingered on pages five and six for most of this period, and virtually disappeared in the second half of January. For such a valuable term, this performance could mean a loss of business for the two banks. At the moment, Natwest is on page four of Google UK and RBS is nowhere, while rivals such as Barclays, Tescobank, Sainsburys and comparison sites are taking the page one positions. If we look at the pages for ‘secured loans’ on the two sites, we can see the problem. The content is identical. 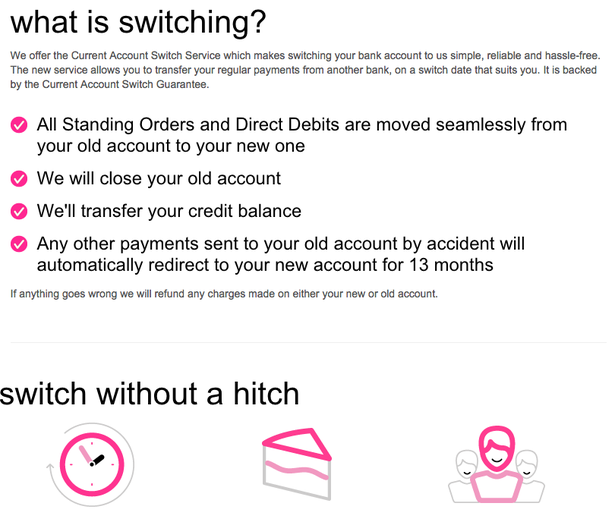 And the equivalent page on Natwest. I can’t spot the difference, and neither can Google. RBS Group has basically set up two sites with identical URL structure, theming and content. No wonder Google sees a semantic layer. If RBS Group wants the two brands to rank highly, and independently of each other, then it needs to consider whether saving money by duplicating content is worthwhile. These two sites should be capable of challenging rival banks in the SERPs, yet it is lingering in nowhere-land on Google. 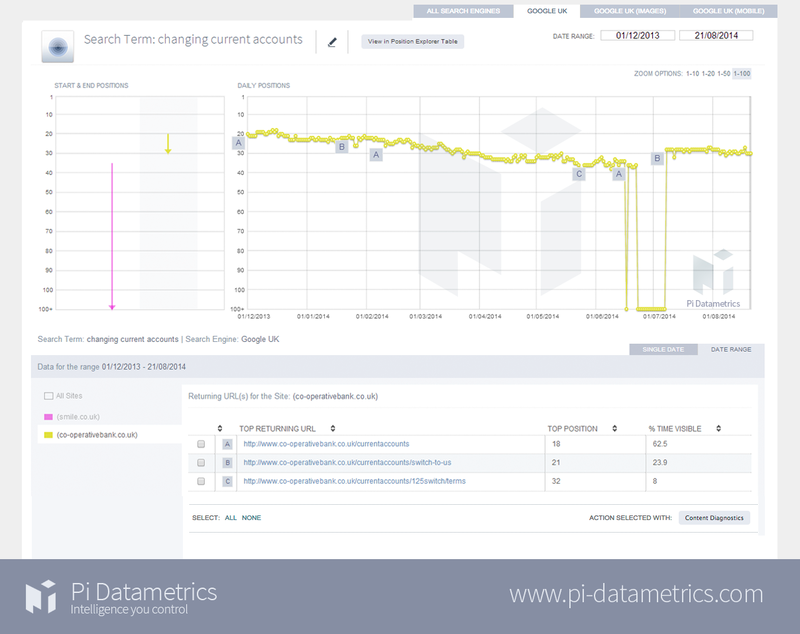 The cost of saving on content is the loss of valuable search traffic. 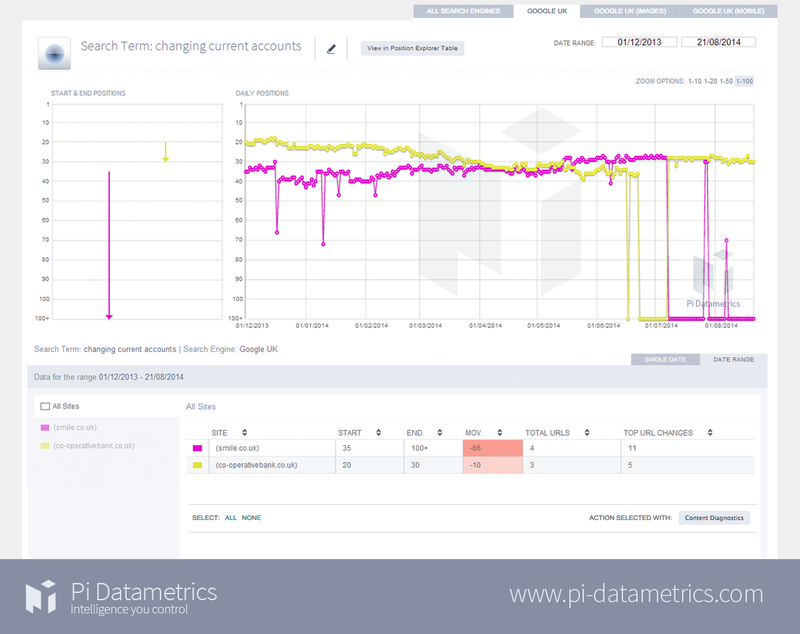 Like RBS and Natwest, these two banks are part of the same group, and they are also affecting each other’s search rankings. And we see this in the chart for the term ‘changing current accounts’, In this example, Co-operative bank starts out at around position 20 on Google, but eight months later it’s down to 30, having spent almost a month at position 100 or below. Smile starts lower, is higher at times, but ends up ranking below 100 in the period this chart covers. We can see a fairly tragic looking dip around mid July, which it doesn’t seem to recover from. Indeed, at I write this post, I can’t see Smile in the top 12 pages on Google for this term, while Co-op is sitting at the top of page four. Co-op’s rankings are slightly healthier and it seems to have recovered from its slump in July. 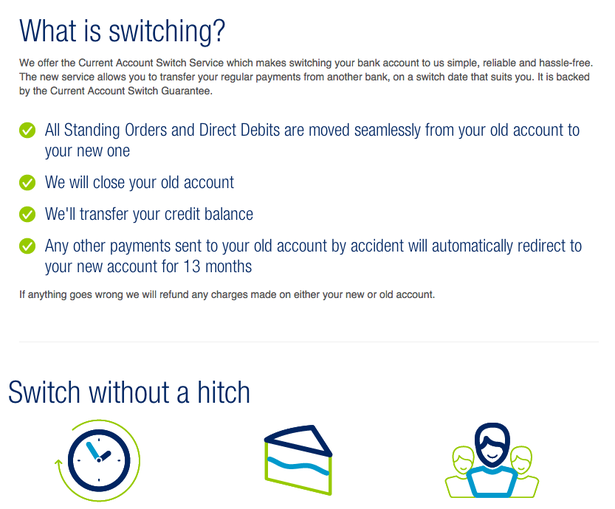 Again, as with RBS and Natwest, we have a case of duplicate content on the two pages. I’m concentrating on the ‘switching’ pages which both would like to rank for this term (A in the Smile chart and B for Co-op) though all the pages shown here have similar issues. Here’s the Smile switching page. It even mentions Co-operative bank. And Co-op banks’s equivalent page. Same design, same content. It seems, for now at least, that Google has decided to favour the Co-operative bank’s page and view the Smille version as duplicate content. 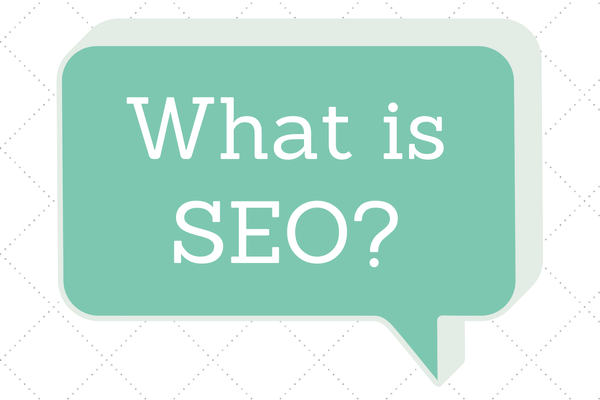 How does Google spot the links between sites? In these cases, the links between the sites are obvious to us, but how does Google decide that there is a relationship? Sam suggests a few signals it may look for. 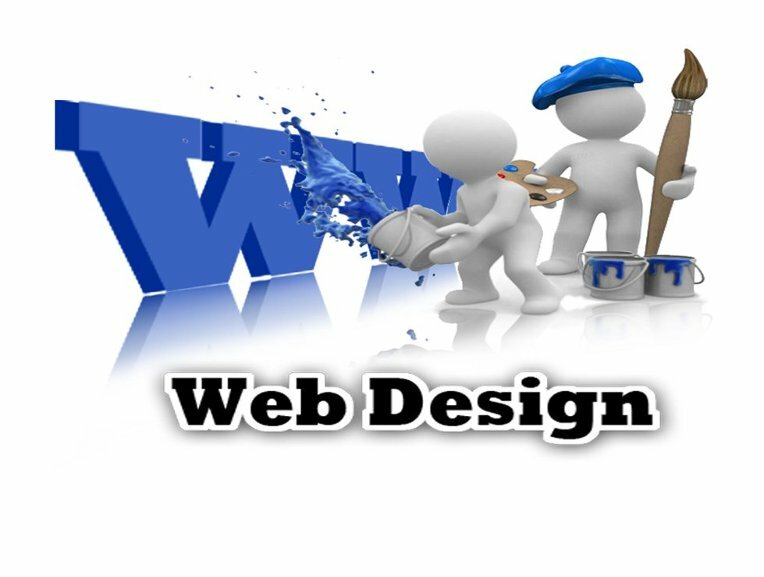 Umbrella or similar network linking to whole site or certain pages. These examples suggest that Google won’t tolerate sites under the same umbrella using duplicate content and pages. It will make a decision to rank one or the other or, if both rank, they may well pull each other down. The simplest solution would seem to be to produce unique content for sites, even if they are part of the same parent company, and are offering the same products.